Chester White pigs originated in Chester County, Pennsylvania. The Chester White was first developed around 1816, using strains of large white pigs common to the Northeast U.S. and a white boar imported from Bedfordshire. Some believe that Chinese pigs might have been added as well. By 1884 a breed association was officially formed, but competing organizations, sometimes for individual strains, continued to appear into the early 20th century. Finally in 1930 all breed organizations were consolidated under the Chester White Swine Record Association. Today the Chester White is a versatile breed suited to both intensive and extensive husbandry. 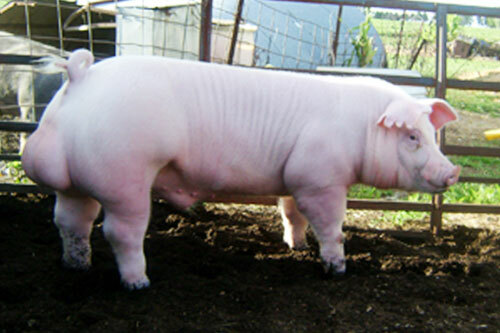 Though not as popular as the Duroc, Yorkshire, or Hampshire, the Chester White is actively used in commercial crossbreeding operations for pork. The Chester White is the most durable of the white breeds; it can gain as much as 1.36 pounds (0.62 kg) a day and gain one pound (0.45 kg) for every three pounds (1.4 kg) of grain it is fed. However since they are white they get sunburns easily.